This is a routine CXR of a young man. What can you see? What is the diagnosis? 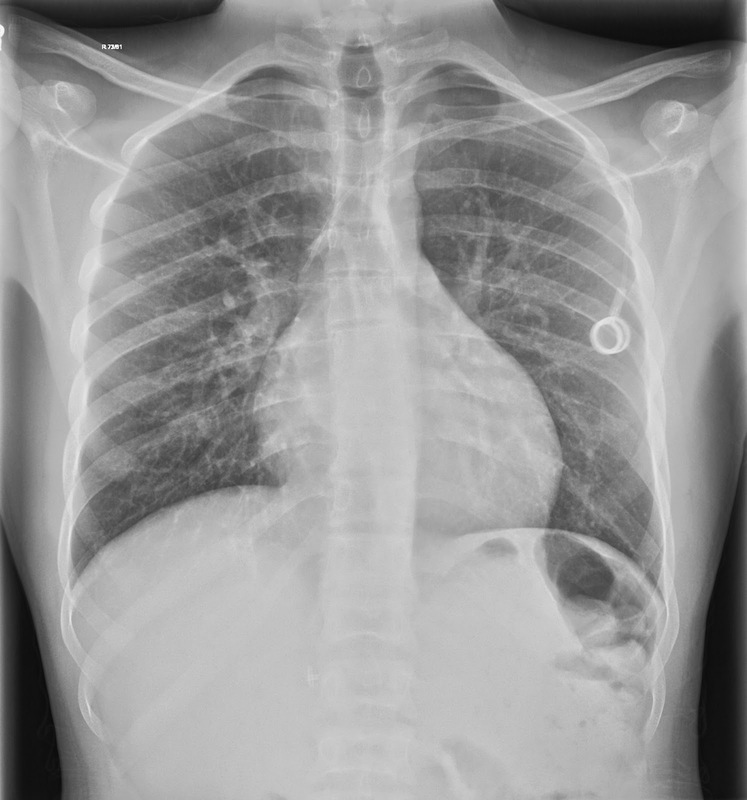 This is a classic x-ray used for examining in radiology exams, because there are a number of findings which add together to tell a story and lead to a definitive diagnosis. This is a chest x-ray of a young male. There is a Port-a-cath venous line with the tip projected over the expected position of the SVC.The lungs are clear and the mediastinum has normal contours. The vertebral bodies are abnormal in shape with depression of the end plates, leading to H-shaped vertebral bodies. There are surgical clips in the right upper quadrant of the abdomen, indicating a previous cholecystectomy. Bowel gas in present in the left upper quadrant, indicating there is no spleen within this space. All of these features lead to the diagnosis of sickle cell disease. The end plate changes are due to microinfarcts caused by vascular occlusion and thrombosis. The gallstones are typically pigment stones secondary to haemolysis. This is one of a number of "classic" exam films which has a story to tell - it is important to become familiar with these in the run up to your exam.